The 18-year-old from Shoreham only made his debut back in July but it has been a meteoric rise for him since then. 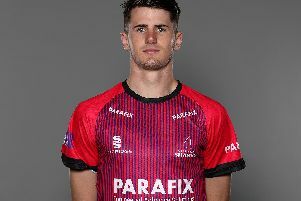 Crane, who came through the ranks at Worthing Cricket Club, started his first Hampshire match against Surrey in the NatWest T20 Blast. His county won that game by 29 runs and Crane finished with figures of 2/35 from his four overs, which included the wicket of Kumar Sangakkara. He said that day was a special one and said: “I did not expect to play as much cricket as I played for the first-team. “My debut was a great experience and to get two wickets in my first match was great. “It was even better that I managed to get rid of Sangakkara. The leg-spinner proved to be a big part of the Hampshire team following that game and played in both County Championship and Royal London One Day cup matches. Crane secured his career’s best figures to date in a four-day clash with Warwickshire. He took figures of 5/35 as his side went on to win that match. That was another special moment for the young gun and he added: “To pick up a five-for was another great moment for me. “In that particular innings I was bowling in tandem with Fidel Edwards and he took five as did I.
Crane has played alongside the likes of Edwards, Ryan McLaren, Jackson Bird and fellow spinners Danny Briggs and Liam Dawson in the first-team set-up. He said they have been a massive help since he broke into the side. He said: “All of the guys have been really welcoming and you can learn so much from them. “To have played alongside Fidel, Jackson and Ryan have been great for me this year. “All of them have played at international level and it’s great to bowl in tandem with those guys. “Danny is another great guy and on a few occasions we have roomed together.